EURUSD is facing resistance of the price channel on 4-hour chart, a clear break above the channel will indicate that the downtrend from 1.4246 had completed at 1.3212 already, then the following upward move could bring price to 1.3900 area. As long as the channel resistance holds, the rise from 1.3212 is treated as consolidation of downtrend, and one more fall to test 1.3146 (Oct 4 low) support is still possible. The U.S. Federal Reserve Bank and other key central banks have intervened to pump more money into the banking system. The Dow rallied over 4.5% on the news. And it’s no surprise the Aussie market was over 2.5% before lunch time. The markets love hot money. And it’s easy to see why the market has gone up. First, ratings agency Standard & Poor’s downgraded 37 major banks. S&P says this is more to do with how they assess a bank, rather than a reflection of the banks’ credit quality. Or so the press release says. That should be bad news for banks. Not on this day. Goldman Sachs [NYSE: GS] was up 7.9%. Citigroup [NYSE: C] was up 8.9%. And Bank of America [NYSE: BAC] was up 7.3%. Turns out that banking bailout beats credit downgrade. Second, China unleashes 350 billion yuan into the system. It looks like the Chinese government had a sneak preview at the PMI data. Before the official numbers were released, the People’s Bank of China reacted first. Lowering the reserve requirements for all banks by 0.5% (from 21.5% to 21%). In short, the Chinese government is pumping $53 billion into the economy in an attempt to distract the market from data showing the economy has hit the wall. Was This Just Another Rigged Market? We asked Slipstream Trader, Murray Dawes what he thought of the central bank intervention. We wanted to know what these big up-days mean for traders and the market. But in typical Murray style, he’s not sitting… or watching… or waiting. He’s trading. On Monday Murray sent out an alert to buy a stock. This morning it’s up more than 3%. Today he saw the chance to short sell a different stock, betting on the market falling after the initial rally. But whatever happens, Murray’s right. If the market was fine… and the banks were safe… there would be no need for six central banks to intervene in the market. If anything, the central bank intervention confirms what we already know: the world economy is in deep trouble. And central banks will do anything they can to stop markets falling. As an investor that gives you plenty of chances to take a punt and potentially benefit from central bank manipulation – such as the trades recommended by Murray. But the most important thing to remember is that while central bank fiddling may give you the chance to punt the market for profits, it isn’t the answer to a sustainable economic recovery. It’s a short term fix… and it won’t work. If anything, we’d say you should use today to sell blue-chip growth stocks you may still own. Because odds are, these big gains will have gone by the end of next week. P.S. Don’t forget to check Murray’s latest stock market update on YouTube. We can’t even tell you who said what. They were just voices. We’re not even sure there was a conversation… just people saying what they had seen. The six central banks are the U.S. Federal Reserve, Bank of England, European Central Bank, Bank of Canada, Swiss National Bank, and Bank of Japan. But aside from the obvious excitement of central bankers meddling (again) and the stock market rallying (again), what does it actually mean? Since then the U.S. market has gained 7.5%. Pretty good for less than a week’s work. And for all we know, the market could gain another 7.5% over the next week, month or year. Despite that, we’re not about to change our view. We still don’t believe the market will be any higher or lower 12 months from now than it was at the start of this week. Remember that markets move based on human behaviour (even with automated trading you’ve still got humans writing the trading programs). And when markets move this quick, humans tend to get long-term memory loss. They look at the day’s events and think this is what markets do… they go up 4.5%… this means everything is fine. It took another eight weeks to wipe out the gains. And by the beginning of October the short-term central bank gains were distant memories. The market had dropped 21.6% from the central bank-induced high. Like all short-term pleasures, this excitement will wear off. It’s times like these your editor feels like the wily old timer, sat in a rocking chair on the porch, watching the youngsters who think they’re the first to experience what’s happening. But while we may snigger at them, we’re not about to get in the way. That’s why we sit… and watch… and wait. How many times did analysts blame the summer sell-off on “uncertainty in Europe”? 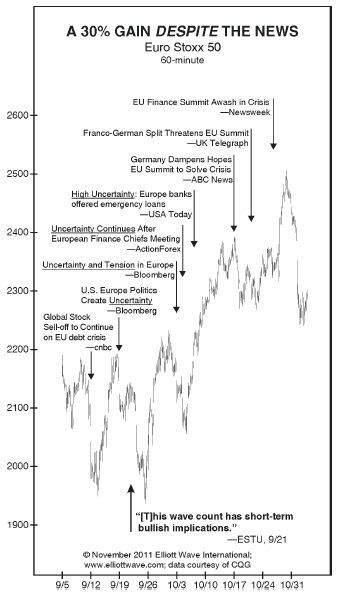 But as stocks rallied over the past two months, notice that the European situation became more uncertain, not less, as the headlines in this chart attest. Who would have guessed that stocks could jump 30% amidst such uncertainty? Likewise, the financial press uniformly attributed last Thursday’s [Oct. 27, 2011] 5% upward spike to reports that EU leaders had reached “broad agreement” on a path forward. But, here, too, uncertainty, not accord, prevailed that day. “Most details remain,” said an economic consultant quoted in the Financial Times. “We have a few more weeks of uncertainty to digest,” added a bank executive with Royal Bank of Canada. Much of what is needed “has not yet been finalized,” concluded the FT. The most important item of news that day was that Greece’s bondholders would take a 50% haircut. But even here, the plan was either short on details, under discussion, or otherwise unclear, according to news reports. As stocks fall again, the press will cite all these reasons and more to rationalize the decline. The European Debt Crisis and Your InvestmentsThe European Debt Crisis is affecting investments across the globe. Elliott Wave International’s analysts have been anticipating and tracking the credit crisis across the European nations, alerting subscribers to the impact it could have on their investments. This free report offers commentary from February 2010 through November 2011 that will help you to better understand what could be in store in the coming months and years. This article was syndicated by Elliott Wave International and was originally published under the headline Markets Aren’t Rational. EWI is the world’s largest market forecasting firm. Its staff of full-time analysts led by Chartered Market Technician Robert Prechter provides 24-hour-a-day market analysis to institutional and private investors around the world. On 24 November China’s Ministry of Land and Resources geological exploration department head Peng Qiming said during a press conference that China’s combined oil and natural gas output, 280 million tons in 2010, is projected to rise to 360 million tons of oil equivalent by 2015, a 23 percent increase in four years and will rise to 450 million tons by 2030, a 62 percent increase over 2010 production, impressive rises in production by any yardstick. And Beijing authorities in their drive are embracing a controversial natural gas production technique that is coming under increasing government scrutiny in both the United States and Britain – hydraulic fracturing, or ‘fracking.” China has started drilling to meet an ambitious annual production target of 80 billion cubic meters by 2020 by which time the government is seeking to meet a target of generating 10 percent of its energy needs from natural gas and 15 percent from renewable sources and launched a national shale gas research center in August 2010. In April the U.S. Energy Information Administration estimated that China has nearly 50 percent more “technically recoverable” shale gas than the United States, placing its reserves at 1.275 quadrillion cubic feet, 12 times the country’s conventional natural gas deposits, as compared with U.S. shale gas reserves of 862 trillion cubic feet. Despite rising environmental concerns about fracking in both the U.S. and Europe, Chinese authorities up to now have shown no such hesitations. On 20 October in Shanghai China’s Ministry of Land and Resources Strategic Research Center deputy head Zhang Dawei said, “The government places high emphasis on developing shale gas and has been actively studying supporting policies,” adding that a national shale gas plan will shortly be announced and more than 10 shale natural gas blocks are to be offered to Chinese state and private companies a the second round of auctions. Earlier this year price and supply fluctuations in China’s oil and coal imports triggered disruptive electricity blackouts, increasing the Chinese government’s interest in the country’s vast reserves of shale natural gas, which will likely prove to be a more stable and predictable energy source as the central government can more easily control the pricing for domestically produced energy supplies. An added benefit of developing the country’s shale natural gas reserves is that over time, Chinese shale natural gas will be cheaper than importing liquefied natural gas over long-distance pipelines from Central Asia as rising volumes come online. There only remain those pesky environmentalists, not a current problem as China’s media is largely state-owned and shies away from contentious topics. Well, if Zhang’s 20 October announcement is anything to go by, U.S. investment in China’s shale gas industry will not include allowing overseas companies in the upcoming sale of shale gas leases. Up to now China has auctioned off two shale natural gas blocks in southwest China to two Chinese companies, including state-owned giant China Petroleum and Chemical Corporation Ltd. (Sinopec), and plans to hold a second auction either later this year or early in 2012. As a consolation prize for foreign energy firms, they can invest in and supply technology to Chinese domestic shale natural gas operators and developer. Despite the prohibition, Chevron Corp., BP Plc and Norway’s Statoil ASA are among international energy companies that have already begun talks to form joint ventures in China to tap shale gas assets. Keep an eye on financial stocks today. Standard & Poor’s cut the debt ratings of 37 financial institutions late yesterday after it applied new ratings criteria to the firms.